I came up with these as a way of using up some left over mashed potato I had knocking about in my fridge. It was really quick and easy and surprisingly tasty if I do say so myself! 1. Drain the salmon and roughly mash it into the potato. 2. Stir in the pesto and lemon juice. 3. Season with salt and freshly ground black pepper (take care here, depending on your taste you might not want any salt at all if you seasoned the potato at the time of mashing). 4. 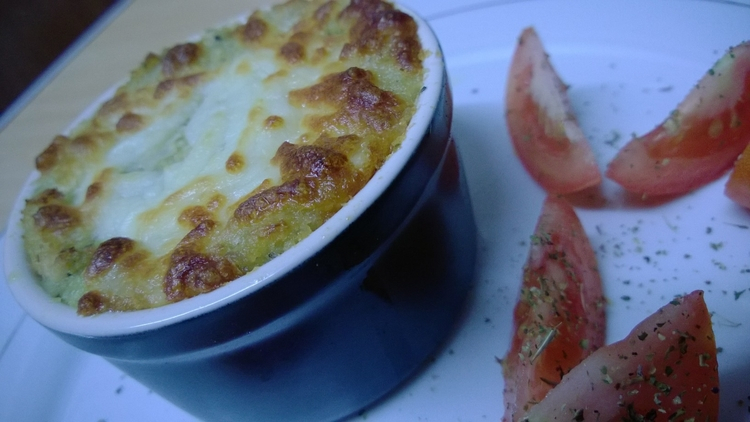 Melt the butter and pour it into four ramekin pots, then spoon the potato and salmon mixture on top. 5. Bake for 10 mins in a pre-heated oven at 180C/350F. 6. Sprinkle grated mozzarella on top of each pot and return to the oven for 5-10 mins until the cheese has melted and browned on top. Best served with a salad. I couldn’t decide whether to say that these serve four people or two people. I actually ate two pots myself, with some tomatoes on the side, although one pot might be enough with a bigger salad, or if serving for lunch. You lost me at the salmon (not a fish person), but what a great idea. I’m sure skipping the salmon would still make them tasty! Hmm, I think you’d need something else instead if you skipped the salmon, maybe some shredded cooked chicken? Or a veggie version with finely cut roasted peppers or asparagus? Love salmon. This sound like a wonderful quick meal, mad special because it’s new. 😀 Thanks, Vanessa. I KNOW I will try this this winter. Mmm. comfort food. I bet I would love a chicken version of this, but my husband isn’t a pesto fan. So I only get to have it once in a while when dining out. Ah well. A small price to pay! Oh I love pesto! Always have a jar in the cupboard, pasta with pesto my the go-to quick meal if I can’t find anything in the fridge! My best meals often tend to be those ones rather than when I’m trying to follow a proper recipe! I love salmon, so I’m sure I’d need two just for myself! I love salmon too, I’m not always that keen on canned salmon though, so I was glad to find a tasty way to use the can that had been sitting in my cupboard for ages!